If you’re in the Greater St. Louis area this weekend, we hope that you can get outside to take advantage of slightly warmer weather. #OptOutside and hike! Thats what Hannah is probably doing. In heels. Because she doesn’t mess around. And who knew? For their engagement session, she tackled the bluff trails of Pete Marquette in Grafton, IL like a seasoned hiker. On a cold, super windy day! Ryan and Hannah met in a not-so-unique way these days. (Well, unless you’re talking to past generations.) This awesome couple met on Tinder. By accident. How does that happen, you ask? Well, Ryan was out to dinner and drinks with his boss and coworkers, and downloaded Tinder to show his boss how it worked. He swiped right on Hannah as he explained. Near the same time, Hannah and a friend were drinking wine and being goofy on Tinder, but fate intervened. It took several weeks of talking before they became comfortable enough to meet, and Ryan was lucky enough to be the first guy ever to pick her up for a date at her house. After Ryan drove an hour to pick her up, they drove another hour together for Olive Garden, because they say they’re both “fatties and love pasta”! Ryan proposed on a boat at Lake of the Ozarks. We still aren’t sure whether he cried because he’s a crier, or because shocked Hannah took a while to say ‘yes’. This beautiful couple is already a little family with two dogs and two children. There’s never a dull moment either, because Ryan and Hannah are absolutely HILARIOUS. Ryan had us rolling the entire session. Their personalities are a match made in heaven, and we don’t expect they’ll EVER get bored of each other’s cheesy jokes. 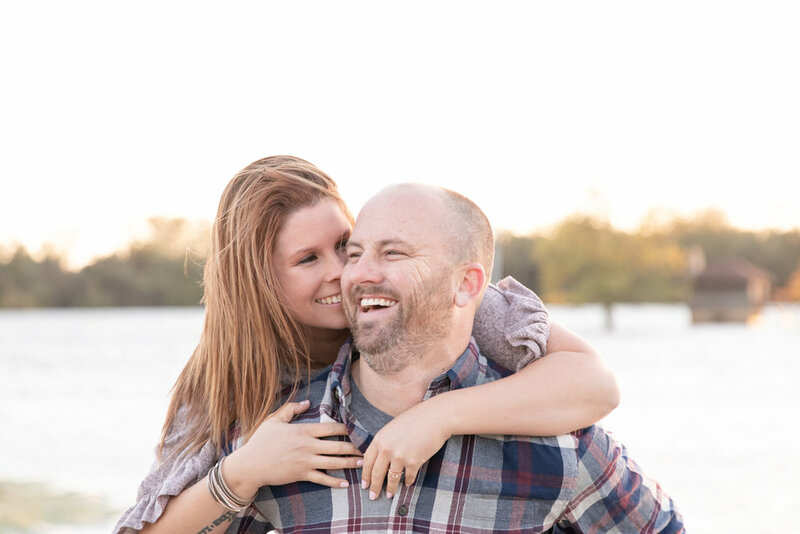 Ryan and Hannah, we cant WAIT for your big day in 2019!! Congratulations from the bottom of our hearts! !